Fr. 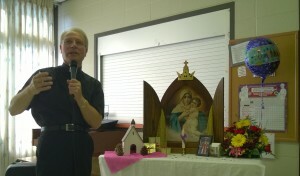 Gerold Langsch presented a Day of Recollection at Immaculate Conception Catholic Church in Pierron, IL. The focus was on Faith and the Schoenstatt commitment to Mary of “Nothing without you; nothing without us!”. Faith through doctrine, devotion, and life is human cooperation with divine grace. As we strive toward holiness, we ask: What do I need to do to achieve holiness? In Schoenstatt, living faith in daily life has a tool to help us grow concretely; it is called the Spiritual Daily Order. It is our way of living the Covenant of Love and fulfilling our part of the commitment with Mary, “nothing without us”. Besides these words of wisdom from Fr. Langsch, we celebrated the day with holy Mass, the rosary, Confession, and Benediction. We are so blessed in Southern Illinois to have Fr. Langsch guide our spirituality! This entry was posted in Education Meetings on October 5, 2014 by cleja.